Don’t Let This Simple Life Lesson Ruin Your Business…. There are some interesting lessons to be had in life out there that we can apply back to how we run our Dental Office and how we communicate with our valued patients and customers. If we fail to take time to observe and ponder on these lessons, we miss some really valuable learning opportunities. Free lessons that we can learn from and therefore amend our behaviours for the better. I’ve always said that running a Dental Office is all about our relationships with our patients. It really has so little to do with our degree of skill and our dexterity and how narrow our margins are compared to the dentist next door. When you go to a barbeque, when you’re out at a dinner party, you never see guests curling up their fingers and retracting their cheeks to compare the degree of marginal adaptation of “my crown” versus “your crown”. No it’s never like that. What the discussion is always centred around is how nice the people who work at that dental practice are and how nice these employees make those patients feel. The public believes that mostly dentists are well trained and will do a great job. That’s their perception and rightly so. If you pass your exams, and get your shingle, it’s assumed that you’re competent at dentistry. Otherwise you would be a panel beater, and not a dentist. So what happens to make patients not return to the dental office? What is it that causes patients to stop going to the dentist? Or to start going to another dentist? Does a Dental Practice really simply let patients *slip through the cracks*? We did it…at my office. I can still recall the day when I was told about the reactivation call to Ken and Molly Smith, who we had not seen for a while. Is that what Ken and Molly thought? Did they think we didn’t care any more? And maybe that’s the message we sent subliminally, as we chased the new patient “shiny object”, and neglected our valued existing patients? Did we not try hard enough to convince Ken and Molly to have their necessary treatment as it was needed? Did we let them “think about their options” where doing nothing was OK, because we told them it was? Is that how we lost their trust in us? Were we bored with our existing patients? So much so that the Smiths thought we had forgotten about them? Were we too presumptive to think that the Smiths were simply waiting to be reactivated by us? Do we just presume sometimes that we can take back up where we left off? Years ago I met a chap at a Chamber of Commerce Networking Event, who was the older brother of a very dear primary school friend of mine. I asked the chap to send my regards to his brother, and asked whether maybe his brother, my old friend, and I could meet up again to remember old times? The reply came back later that yes, he had told his brother. Another time, I tried to connect on Facebook a few years ago with a very good high-school friend. My friend was listed as only having one friend on Facebook. When I approached that other person to open up the lines of reconnection, she came back at me with a message that John did not want to reconnect and that he “wished me luck in finding all my friends”. Do you think John and I just grew apart, and that I was living in Fantasyland thinking we could reconnect? Ouch number two, I guess. Finally, last month, on Facebook, I received a Friend Request from a woman living in Northern Queensland Australia. We had no mutual friends on Facebook. Although I did not recognise her name, her face looked vaguely familiar. A close look at her photos had me convinced it was an ex-girlfriend of mine from thirty-two years ago. I was surprised and flattered by the Friend Request, but I thought that not much good could come from reconnecting here. After all, if she’d have tried harder thirty-two years ago, maybe things would have been different. In all these cases, disconnection has caused a breakdown in the relationship. One side thought that there was no reason NOT to reconnect. But the other side had moved on…. If you want to maintain your friendship, your relationship, you need to keep in touch. Because time moves on for some. And when it does move on, it creates a chasm some times. To prevent the disconnect, you need to stay in contact. In your personal life as well as in your professional life. Are you going out of your way to keep in touch with your friends? Are you going out of your way to keep in touch with your valued customers? Cards, hand-written notes, small gifts. It doesn’t really take much more. 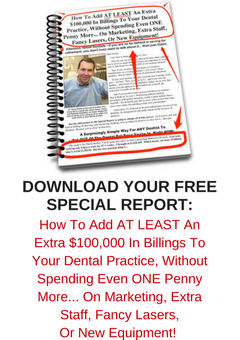 Is Having An Associate Dentist Burning You Money? Recently I wrote about Dentists failing to keep track of their numbers. And one number that dentists fail to know is what is the average two-year value of a New Patient to their practice. But they don’t even know what an average new patient is worth to their practice. Different types of advertising will bring in different types of patients…. And different types of patients will need different types of treatment. Additionally, different dentists will see differently within the mouth. Dentists proficient at orthodontic diagnosis will see things that other less proficient dentists may never see. A dentist educated in TMJ and OSA will be more astute to diagnosing these conditions and treating them than someone who has never learned about these modalities. Some dentists will have higher treatment plan case acceptances from their patients than other dentists who are happy to let their patients “think about it”. All of these variables contribute towards the success or lack thereof of a dental practice. I was talking to a dentist yesterday about a dental practice where the total collections of the two hygienists and the two associate dentists was still a lower amount than the collections alone of the owner principal dentist. And what that means is that probably a new patient to the owner dentist is worth more to the practice than a new patient seen by the associate dentists. Would the owner dentist be better off if the associate dentists diagnosed more thoroughly, and recommended treatment better and were more convincing to the patients about the consequences of NOT having treatment? I took over a practice where the retiring dentist gifted me his patient files, and when I met the one hundred or so patients who were happy to come to see me at my nearby office, I saw more patches than at a quilting convention and not one tooth crowned, in a demographic of patients born primarily prior to 1950. Which meant there was a significant amount of comprehensive restorative work to do in these patients to make their teeth feel stronger. Another Dentist I know had associate dentists with gaps in their appointment books. And so he funneled more new patients their way. And not only were these associate dentists not busy, they complained to the owner that the practice fees were too high for them to charge their patients. Yet the owner dentist had a full book of patients happy to see him at those fees? The problem was not the fees. The problem was that the associate dentists were not so popular with patients in the practice and it did not matter whether you supplied those associates with a fire hose of new patients, they still weren’t diagnosing and presenting and doing the dentistry. It’s important for a dental practice owner to know what the New Patient Value is to the practice for each dentist that they have working there. Because if one dentist has a significantly lower New Patient Value, that means that his patients are not receiving the treatment and the care that is in their best interests. And their health suffers as a result of this. Would you rather be treated for everything? Or only be treated for what the dentist thinks you will want, or guesses that you can afford? The patient told me not to second-guess him and not to give him options. It’s up to all dentists to present treatment with authority. It is your duty to make sure your patient receives all the necessary treatment you diagnose. For them not to is negligent. Telling yourself that you gave them all the options is not the answer. Patients do not have dental degrees. They need direction. Customer Service? How Are YOUR Systems Really? So you think your office does pretty good customer service? After all, you’ve worked out your systems, and nobody is complaining? Are your customers complaining “on the inside”? Are your customers simply just putting up with what you dish up as being the industry norm? Because if the industry norm is not so good, then helping your office to become better than the norm will make your office look like Customer Service Superstars. Today I had an appointment at a Specialist Radiology Practice for a cortisone injection for my replaced shoulder. The cortisone is to reduce the inflammation in the bursa. So here’s my journey for the morning…. When I rang the other day to schedule the appointment I was asked to come at 9:20am for a 9:30am appointment. And if you tell me to come early, I figure it’s so if I’m there early, and the doctor is running early, I’m in and prepped and ready for my shot well ahead of time. And just like in an efficient Dental Office, the Radiology Practice has multiple rooms so that the assistants can have me in, shirt off, disinfected and lying on the table so that the doc only has to come in and make small talk and shoot me up and then disappear…. Rather than the Doc sitting in one room only all day waiting for that room to be turned over continuously before the next patients can be brought in. Anyway, back to my arrival. I worked out that the reason they ask you to arrive ten minutes early is so you can wait in line for ten minutes. Before you even get to the counter to answer the questions. And yes, I’ve been there many many times before. And today these questions were asked of me while another woman [who was waiting in line behind me] was brought forwards to pay for treatment she must have obviously just received. So the receptionist checking me in started to multitask. It became very confusing for me. Because I wasn’t quite sure whether she was speaking to me or to the woman? But I should be grateful to witness and experience this wonderful exhibition of multitasking, shouldn’t I? The truth is that sufficient staff would allow for the easy processing of inbound patients as well as the efficient egress of those patients needing to settle their accounts, without the need for creating an unnecessary logjam. While waiting in line for one of the three receptionists checking people in [there was also a fourth woman processing payments], I also overheard one of the ladies talking on the phone to someone making an appointment. Interestingly, this very busy office had receptionists taking phone calls [via headsets] at the same time that they were meant to be dealing with live present, visible customers waiting to be served. The use of the word “about” creates a vagary that allows the patient to arrive five, seven, three, two or eight minutes prior to the appointment time. My thought is that if you want them there for their allotted time then you need to be specific. I’m soon called and brought down into the treatment room by the doctor’s assistant, where I’m prepped and made ready for the doctor. And she’s telling me that there are two patients lined up before me before the doctor sees me. We joke about his workload, and she tells me that the doctor usually can do up to forty injections per day. So my rudimentary math works out that forty lots of five minutes [and I’m being generous] is 200 minutes so that’s a fairly healthy morning’s work? And at $300.00 a pop that makes $12K for less than three and a half hours of work. Now, that’s probably not the kind of information that needed to be shared with a patient. And especially a patient like me who is disappointed when I can’t use my Amex card to acquire more points every time I get zapped or shot there. And I know the ROI is not as good as the ophthalmic surgeon who billed me $1100.00 for a five-minute retinal zapping with a laser. But not all patients are stupid. So talking out of school, in your office is not wise. Or in a social setting it’s simply just called gossip. And it has no benefit. You certainly do not need to overshare in a dental office. If you are oversharing you need to work out how to eliminate it. Finally, after my short, and very painless injection, I’m re-dressed and out on my way to settle my account. Where again, there is a short delay. Despite the fact that there is no one else there seeing the lady handling the payments. She’s being distracted by another office employee in their area working out who is at morning tea and who is going next. Can’t this be worked out ahead of time, and not in front of paying customers? Can’t the schedule for breaks be planned in advance, without the need for a “break supervisor” to oversee operations? In front of paying customers? Again, they have a system. But it’s an inefficient and very public system. That could be much better. How are the systems in your dental office? Are they in need of review or vision? Is your performance better than average, but still very average. Is your office performance reflective of the fees that you charge? Because there will always be people wanting to pay for an “experience”. But it needs to be something Above and Beyond. From time to time in our dental careers there are opportunities in business to gain a competitive advantage in the marketplace. I’ve been fortunate throughout my Dental practicing career to be at the right place at the right time on a number of occasions, and I see another great opportunity presenting itself now for those dentists who grasp hold of it. This is an interesting opportunity, because my initial thoughts about this were at odds to my core belief of offering World Class Customer Service at all times. But having said that, I got down from my high horse and weighed up all the facts and then and only then was I able to see the wood for the trees. The advancement I am speaking of involves the use of technology. And as you know, I’ve written many many times about how technology has been used in the dental office to replace the use of the spoken word, many times to the detriment of the overall process. Sometimes the process of automation has overridden the benefits of really having a human being there when we need one. We’ve all gone through the frustration of calling a help line with a big company only to have to speak clearly to a machine that is trying with great difficulty to recognise exactly what we are saying? Who actually trusts that leaving a ten second voice to text message on someone’s mobile phone will in fact be translated and transcribed exactly as we need it? And even Siri has trouble decoding our questions and dictations, doesn’t she? In the same way that trying to have a conversation with a teenager wearing earplugs attached to music is frustrating to a baby boomer, then so too is the concept of technology being beneficial to the Dental Customer Service process on every occasion. And yet in that instance a geek has been able to create an emperor’s new clothes situation as a substitute for a process that has multiple beneficial advantages. So what is the new advancement in technology that has impressed me so greatly lately? It’s the advancement in the comfort and precision of online dental appointment scheduling, especially for new patient enquiries and bookings. I’ve been opposed to giving total strangers to the dental practice easy access to our blank canvas of our appointment schedule. And after all, if there’s one piece of continued resistance I find in the Dental offices that I consult with it is the concept of pre-blocking and “templating” our schedule for maximum production and efficiency. Efficiency for the dentist, efficiency for the dental assistants, efficiencies for the front office and efficiencies for the hygienists. And all the interactions that go on between these modalities in the dental office. Templating our schedule allows for the dental office to run seamlessly with far less interruptions and incongruences. Firstly, I found a programme that allowed us to reflect online appointment availability selectively for any new patient enquiries and bookings without causing major disruptions to our schedule. I found a company that allowed you the office to choose which time slots you wanted to make available or not available at any given time on any given day for any given operator. And so this allowed the Dental office to create an illusion of busyness to the online enquirer. Important to the process of online scheduling is the creation of illusion and mystique. We don’t need to make all our times available. A great company will allow you to pick and choose your online availability. The second and most important thing that I needed to let go of was the concept of needing to have someone in my office in charge of and controlling the new patient enquiry, thus verbally helping the patient schedule a time with the aid of our service and friendliness. You see those sort of things are always nice when we receive them, but sometimes, as a consumer, we do not need to be babysat nor do we feel the need to be babysat at all. Sometimes we just want to get in and get out quickly. And more and more, in other fields of life, this is what’s happening. When booking a restaurant, it’s nice to simply scan an app like Open Table or Trip Advisor and book our dining table there and then. When we’re going to the movies or a concert or a sporting game, we have the ability to book our exact seats without needing to talk to someone. We get to see the venue map and seating arrangements right there and then. So why as dentists are we not allowing our busy patients the opportunity of scheduling their dental appointments remotely? It just makes no sense for us to not get on and ride this technology wave and let this happen. Well, assuming that your new patients can now schedule an appointment with you via an online process, what are the advantages? Well firstly, it makes your office look ahead of the game. If your office is seen to be one of the only offices around with this service, your potential patients will gain the perception that your office is at the cutting edge of technology. And that may or may not be exactly the truth of the situation, but the perception received by the scheduling new patient is profoundly valuable to your practice. If the process is relatively seamless, your new patient now has the opportunity to tell their friends about how they found this new wonderful high tech dental office that allowed them to schedule an appointment without the need for calling. How good is that form of word of mouth advertising? Finally, the fact that someone has scheduled an appointment allows us to make contact with them and wow them even more. Because now we have their data. So now we can contact them with news and information and gifts ands surprises well before their appointment. And that’s something that most other dental offices never ever do. At most dental offices patients are lucky if they receive a confirmation text message before their scheduled appointment. That’s a pretty ordinary way of communicating with a new patient between scheduling and the actual appointment. I see this opportunity to WOW ands overWOW as being a wonderful way of making your Dental Office stand out and be talked about in the community at this time of oversupply and competitive cut-throat cost cutting by our opponents. Remember people don’t mind paying extra when there is value and perceived value attached to their purchase and their experience. And this gives the forward thinking Dental office the opportunity of standing out in a loud crowded world of vanilla. Which company am I seeing as the market leader here? Is Your Business Really Trying Harder? Yes, you really can’t make this sort of thing up. Here is episode three, the last of a series of customer service horror stories that I sadly experienced during a recent twenty-four hour period. Here is my point. As a small business, Dental Offices need to be mindful of the fact that if we have no customers then we have no business. And big businesses need to be mindful of this fact too. This third instance of ignoring the consumer occurred last week with another very big company. This company totally went about its processes as if the paying customer was not even present. I mean as if the paying customer was not even there. This company could not have cared less about its customers, unless they were asked.. Although they were pleasant when questioned, the fact is, as a customer I should not have had to question the service or the processes. This may have been due to the staff having to defend their operational protocols? In a Dental Office, sadly, I see staff put into this same situation with regard to office procedures. And when patients get treated this same way they simply show their disdain by walking straight out the door and never returning. Customers and patients should not have to tolerate this sort of business behaviour when they are paying money to that business. This particular incident only went on to show me that there needs to be logical thought toward protocols in a business so that customer service appears paramount. Customers should not be simply being taken for granted. But if nobody’s telling a business that what they’re doing is poor and needs fixing, then they’ll simply keep on blundering on regardless. All customers want to be made to feel valued. And that’s all we need to remember. Sadly, at Avis at Melbourne Airport last month, this was not how I was made to feel. I was on my way from Sydney to Melbourne by plane and then I needed a hire car for the day so that I could drive to Geelong and back and see my Shoulder surgeon for my twelve-month post-operative review. So I had pre-booked a hire car from Avis. When I arrived at the counter within the Airport, there were two people in front of me, one being served who seemed to be taking an inordinate amount of time. And only one person serving. So I took the odds, and headed to the outlet in the car park, where I found their office to have only one attendant and a client just leaving. When I told the attendant about my booking she politely let me know that I was in the Avis-Preferred office, and that I needed to go to the office across the way. In THAT Avis Office there were three attendants serving. But there were seven people in line before me. Fortunately the service was good and the line shortened quickly, and I was out in the pick-up area with my paperwork in hand in no time at all. Once in the pick-up area I was asked, along with everyone else, to hand over my paperwork to one SOLO woman with a walkie-talkie who then proceeded to make herself scarce? In dribs and drabs, and I mean one at a time well spaced apart, cars were appearing and customers were dispatched. So slow, that it took forty minutes standing there in very cold icy temperatures waiting for my car to appear. Cars were arriving very sporadically. When I asked the female with the walkie-talkie about the delay she told me that my car was being cleaned. I asked her whether they waited for me to check in and pay before they decided to clean my car, because it seemed logical that if I had made a booking that I would want the car ready at the time that I had booked it for? It seemed crazy to think that it took forty minutes to get my car and yet it took only fifty-five minutes of flying time to get me from Sydney to Melbourne. I had not allowed forty minutes of service time to pick up my car. This was because only two weeks earlier in Grand Rapids Michigan I had literally walked off my plane and completed my paperwork with Enterprise and been directed to my car in the not in less than ten minutes? Why for whatever reason does Avis have to bring your car to you in the airport car park? It makes no sense if it is delaying my service, and displaying gross inefficiencies. Once my car DID arrive downstairs another customer tried to jump into it because he too was waiting on a car with the same colour and make. This confusion could have been avoided if the customers were allowed to go fetch their own cars, much like they do in Grand Rapids. The walkie-talkie lady suggested that I might like to become an Avis Preferred client so that I could receive better service. I told her that if they couldn’t get the base level correct, then why would I even contemplate giving Avis more money? In fact, I said that from this day on I’ll spend my hire car dollar with any other company bar Avis, because I don’t believe they are doing anything right in trying to keep my business. How’s your Dental Practice going? Do you keep clients waiting an inordinate amount of time because of inefficient processes? Are your processes creating difficulties for your front line employees? Are your processes sending the wrong messages to your customers? Do your antiquated processes need a rethink? Is there a better way that you could be doing things? And are other competitors doing things in a better way? Sometimes the answers are out there and easily observable. To me it looked like Avis were not trying very hard to find a better way, despite a better way being out there and being used by their competitors.